Since 2008’s Iron Man, Marvel has been dominating the superhero film genre with its Avengers and stand alone super hero films. Key movies such as The Avengers, Iron Man, Guardians of the Galaxy, and Captain America: The Winter Soldier have been considered some of the best superhero movies of all time. Now, after nearly eight years of the characters working together, it has come time for them to clash in the infamous Marvel Civil War. The second film of 2016 to show superhero’s clashing has come raising the question of where it will rank within the thirteen films of the Marvel Cinematic Universe. For me, it might just take the number one spot. Following the events of Avengers: Age of Ultron, the heroes are being forced to submit to government control due to the massive amounts of destruction that has been left in the wake of their battles. A registration act is proposed forcing heroes to chose wether they want to be put in check by the government, or resist and go rouge. The return of Bucky Barnes, A.K.A The Winter Soldier, further complicates the situation, especially for his friend Captain America. Lines are drawn and the heroes must chose to join Team Cap and Team Iron Man. 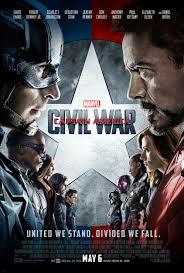 Marvel fans had been wondering when the Civil War story arc would be adapted from the comic page to the big screen. Hints at the conflict between Steve Rodgers and Tony Stark had been hinted at in previous films of the franchise and now the long awaited conflict has come to fruition. Unlike Batman V. Superman however, this one does not disappoint in any way. This is one of those rare instances where the movie is better than the book, or in this case, graphic novel. The characters motivations for picking a side felt too cut and dry in the comic. Very little time was devoted to character motivations in the book unless you had read every single tie in issue for the arc. In the film however, there are various complications that are thrown at every characters which give them more of a reason to pick the sides they pick. It’s easy to get behind each character and understand their motivations for doing what they do which makes everyone far more interesting than anticipated. In a film with a cast as large as this, it’s easy to forget about certain characters, but here you see why characters do the things they do. Strong character motivation is key in many movies and every character gets their moment in the spotlight here. Of course, there is more focus on Iron Man, Captain America, and The Winter Soldier throughout the film, but none of the supporting cast members get left out. Characters such as Scarlett Witch and Vision are given their respective time on screen and have their own stand out moments both in the dialogue driven moments and action scenes. There are also two classic Marvel characters who receive very strong introductions to the Cinematic Universe in this film as well. Chadwick Boseman as Black Panther feels as if the King of Wakanda had been ripped from the page and placed on the screen for all to enjoy. Despite this being his first appearance in the MCU, there is still engaging development for him. The other new face is Spider-Man, who is being rebooted for the third time. Tom Holland takes the mantle of the web head following Andrew Garfield and Toby Maguire. I feel that Holland is the best Spider-Man ever committed to screen despite him having such little screen time. Holland portrays Spidey as the young and jokey kid he’s been depicted as in the comic. He’s funny, can hold his own in a fight, and so good that I cannot wait to see him in Spider-Man: Homecoming next year. Both Boseman’s and Holland’s performance as their respective heroes makes me very eager to see their respective solo films and the impact they will have in the MCU. The action scenes in Civil War are some of the best Marvel has ever depicted. The airport fight in particular shows off each characters and offers opportunity for amusing banter between them. Well framed and choreographed action sequences are littered throughout making for intense moments. The gritty and realistic nature of these fights helps add to the tension keeping you on the edge of your seat until the very last punch is thrown. Overall Captain America: Civil War has become my personal favorite Marvel film out of the thirteen to come out in recent years. It has many character building moments that are not only engaging, but emotionally impactful as well. The Russo brothers perfectly direct every action scene, giving them a gritty feel fueling the tension. Character development is extremely prominent and introductions for the two new heroes promise great films in the future. I highly recommend you go see Captain America: Civil War as soon as possible.